Leaving a $0 tip on a $30 bill at Applebee’s is bad enough. But then taking the effort to write “Stop Eating B*tch!” as a “tip” is crossing the line from being a bad consumer into being a horrible human being. 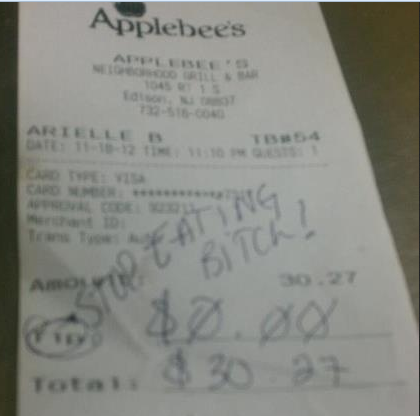 But that’s exactly what some customer at an Applebee’s in Edison, NJ, recently did to their waitress. The receipt, which has been burning up Reddit for two days, was apparently given to a waitress described as overweight. As the top-rated comment on the story points out this check says there was only one guest at the table, meaning one person consumed more than $30 worth of Applebee’s food, which is not exactly known for its low-cal healthiness. So perhaps this is a case of a pot calling the kettle fat. Regardless, even if this customer’s meal was the absolute worst food and service he’d ever experienced, there are better ways to handle this than making personal insults about the server. Talk to the manager. File a complaint with Applebee’s HQ. Go online and complain to your heart’s content. But there’s no excuse for ruining someone else’s day just because you’re a jerk. We wouldn’t be shocked if the customer was eventually outed by the Internet. Some people on this Reddit are already trying to decipher the signature on the receipt.